Say what you will about naked mole-rats, but their bodies have a trick that lets them survive periods of oxygen deprivation. According to Park and colleagues across three continents, the rodents do have a trick up their sleeves. Most mammals, including humans, run on glucose, which is a sugar that the digestive system gets from our food and turns into energy to keep our bodies warm and our brains running. But the process of taking that sugar and turning it into energy requires oxygen. Without oxygen, the body can't create energy, and without energy, cells die. When the researchers looked at tissue samples taken from the mole-rats at various times during the oxygen deprivation, they noticed a spike in levels of another sugar, fructose, about 10 minutes in. "We weren't looking for it, but bang, fructose goes way up in the blood and then it goes way up in the organs and it gets used by heart and brain," Park says. The naked mole-rats appear to have the option of switching fuels from glucose, which requires oxygen to create energy, to fructose, which doesn't. Humans are capable of storing and using fructose in the liver and kidney, but as Park explains, we don't have enough of the correct enzyme to create energy directly from fructose. Nor do we have enough of the proteins necessary to move fructose molecules into the cells of vital organs. Our cells have to convert it into glucose in order to use it. The cells in the brain, heart, liver and lungs of naked mole-rats are all outfitted with proteins that moves fructose into the cells, and with the right enzyme to create energy from it. "They have a social structure like insects, they're cold-blooded like reptiles, and now we found that they use fructose like a plant," Park says. Some fish and turtles manage to manage to survive without oxygen for months, sealed in frozen ponds and lakes. But Jay Storz, an evolutionary physiologist at the University of Nebraska who researches how animals adapt to extreme conditions, says those creatures still use glucose to fuel themselves. They just drastically reduce their energy needs. 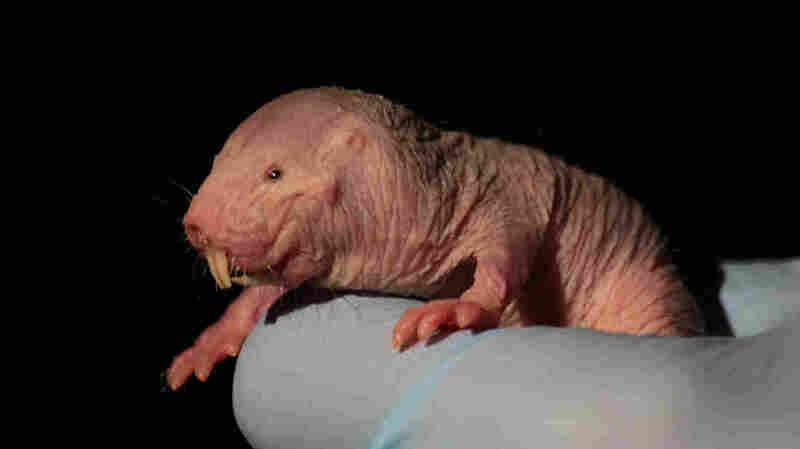 The naked mole-rat's ability to switch tracks to a different metabolic fuel is really surprising. "They're doing something that really has not been described before for any vertebrate animal," Storz says. "They're basically using an alternative fuel." One question for future research, he says, is how the animals manage to get rid of lactate, a molecule that builds up during anaerobic metabolism and can alter blood chemistry. Park and Storz hope that the finding about naked mole-rats could someday help develop a way to aid patients suffering from oxygen deprivation from something like a heart attack or stroke. "It would be great if we could beef up the fructose pathway in those patients and extend the amount of time that they have to get to a health care situation," Park says. Storz imagines mole-rats aren't the only extreme animals with potential clues to alleviating human medical problems. "There are probably a lot of other animals out there that are doing equally bizarre things," Storz says. "There's a lot of research and development that evolution has done, and we just have to figure out ways to capitalize on that." But that, they say, is a job for scientists in another field.